Joseph Roland "Joe" Barbera (/bɑːrˈbɛrə/ bar-BERR-ə or /ˈbɑːrbərə/ BAR-bər-ə; Italian pronunciation: [barˈbɛːra]; March 24, 1911 – December 18, 2006) was an American animator, director, producer, storyboard artist, and cartoon artist, whose film and television cartoon characters entertained millions of fans worldwide for much of the 20th century. Through his young adult years, Barbera lived, attended college, and began his career in New York City. After working odd jobs and as a banker, Barbera joined Van Beuren Studios in 1932 and subsequently Terrytoons in 1936. In 1937, he moved to California and while working at Metro-Goldwyn-Mayer (MGM), Barbera met William Hanna. The two men began a collaboration that was at first best known for producing Tom and Jerry and live action/animated hybrid films. In 1957, after MGM dissolved their animation department, they co-founded Hanna-Barbera, which became the most successful television animation studio in the business, producing programs such as The Flintstones, Yogi Bear, Scooby-Doo, Top Cat, The Smurfs, Huckleberry Hound and The Jetsons. In 1967, Hanna-Barbera was sold to Taft Broadcasting for $12 million, but Hanna and Barbera remained head of the company until 1991. At that time, the studio was sold to Turner Broadcasting System, which in turn was merged with Time Warner, owners of Warner Bros., in 1996; Hanna and Barbera stayed on as advisors. Hanna and Barbera won seven Academy Awards and eight Emmy Awards. Their cartoon shows have become cultural icons, and their cartoon characters have appeared in other media such as films, books, and toys. Hanna-Barbera's shows had a worldwide audience of over 300 million people in the 1960s and have been translated into more than 20 languages. "I was, quite honestly, not in the least disappointed. I had proven to myself that I could do a storyboard, and that I had gained the experience of presenting it. For now, that was enough." The original storyboard, which had been passed down through the Barbera family, went on sale at auction in November 2013. Modeled after the Puss Gets the Boot characters with slight differences, the series followed Jerry, the pesky rodent who continuously outwitted his feline foe, Tom. Hanna said they settled on the cat and mouse theme for this cartoon because "we knew we needed two characters. We thought we needed conflict, and chase and action. And a cat after a mouse seemed like a good, basic thought." The revamped characters first appeared in 1941's The Midnight Snack. :46 Over the next 17 years, Barbera and Hanna worked exclusively on Tom and Jerry, directing more than 114 popular cartoon shorts. During World War II, they also made animated training films. :92–93 Tom and Jerry relied mostly on motion instead of dialog. Despite its popularity, Tom and Jerry has often been criticized as excessively violent. :42:134 Nonetheless, the series won its first Academy Award for the 11th short, The Yankee Doodle Mouse (1943)—a war-time adventure. Tom and Jerry was ultimately nominated for 14 Academy Awards, winning 7. No other character-based theatrical animated series has won more awards, nor has any other series featuring the same characters. Tom and Jerry also made guest appearances in several of MGM's live-action films, including Anchors Aweigh (1945) and Invitation to the Dance (1956) with Gene Kelly, and Dangerous When Wet (1953) with Esther Williams. In addition to his work in animated cartoons, Barbera and Tom and Jerry layout artist Harvey Eisenberg moonlit to run a comic book company named Dearfield Publishing. Active from 1946 to 1951, Dearfield's titles included "Red" Rabbit Comics, Foxy Fagan, and Junie Prom. Quimby accepted each Academy Award for Tom and Jerry without inviting Barbera and Hanna onstage. The cartoons were also released with Quimby listed as the sole producer, following the same practice for which he had condemned Ising. :83–84 Quimby once delayed a promised raise to Barbera by six months . :82 When Quimby retired in late 1955, Hanna and Barbera were placed in charge of MGM's animation division. As MGM began to lose more revenue on animated cartoons due to television, the studio soon realized that re-releasing old cartoons was far more profitable than producing new ones. :2–3, 109 In 1957, MGM ordered Barbera and Hanna's business manager to close the cartoon division and lay off everyone by a phone call. :2–3, 109 Barbera and Hanna found the no-notice closing puzzling because Tom and Jerry had been so successful. Barbera's first foray into television was a 1957 collaboration with Robert D. Buchanan, Colonel Bleep. The series, the first ever cartoon produced specifically for color television, would feature some of the futuristic designs and limited animation Barbera would later carry over to his other television productions. Barbera's involvement in Colonel Bleep (and with Buchanan) was apparently short-lived; his only known credited involvement was a creator credit. The first offering from the new company was The Ruff & Reddy Show, a series which detailed the friendship between a dog and cat. Despite a lukewarm response for their first theatrical venture, Loopy De Loop, Hanna-Barbera soon established themselves with two successful television series: The Huckleberry Hound Show and The Yogi Bear Show. A 1960 survey showed that half of the viewers of Huckleberry Hound were adults. This prompted the company to create a new animated series, The Flintstones. A parody of The Honeymooners, the new show followed a typical Stone Age family with home appliances, talking animals, and celebrity guests. With an audience of both children and adults, The Flintstones became the first animated prime-time show to be a hit. Fred Flintstone's signature exclamation "yabba dabba doo" soon entered everyday usage, and the show boosted the studio to the top of the TV cartoon field. The company later produced a futuristic version of The Flintstones, known as The Jetsons. Although both shows reappeared in the 1970s and 1980s, The Flintstones was far more popular. As popular as their cartoons were with 1960s audiences, they were disliked by artists. Television programs had lower budgets than theatrical animation, and this economic reality caused many animation studios to go out of business in the 1950s and 1960s, putting many people in the industry out of work. Hanna-Barbera was key in the development of an animation technique known as limited animation,:75:54 which allowed television animation to be more cost-effective, but often reduced quality. Hanna and Barbera had first experimented with these techniques in the early days of Tom and Jerry. :74, 115 To reduce the cost of each episode, shows often focused more on character dialogue than detailed animation. The number of drawings for a seven-minute cartoon decreased from 14,000 to nearly 2,000, and the company implemented innovative techniques such as rapid background changes to improve viewing. Critics criticized the change from detailed animation to repetitive movements by two-dimensional characters. Barbera once said that their choice was to adapt to the television budgets or change careers. :75:54 The new style did not limit the success of their animated shows, enabling Hanna-Barbera to stay in business, providing employment to many who would otherwise have been out of work. Limited animation paved the way for future animated series such as The Simpsons, SpongeBob SquarePants, and South Park. In December 1966, Hanna-Barbera Productions was sold to Taft Broadcasting (renamed Great American Communications in 1987) for $12 million. :162, 235–236 Barbera and Hanna remained at the head of the company until 1991.:16:151 At that point, the company was sold to the Turner Broadcasting System for an estimated $320 million. Turner began using Hanna-Barbera's television catalog as material for its new Cartoon Network cable channel in 1992, and by the mid-1990s Hanna-Barbera was producing several original series for Cartoon Network, among them Dexter's Laboratory and The Powerpuff Girls. In 1996, Turner merged with Time Warner, owners of Warner Bros., who would eventually absorb Hanna-Barbera into Warner Bros. Animation. Barbera and Hanna continued to advise their former company and periodically worked on new Hanna-Barbera shows, including shorts for the series The Cartoon Cartoon Show and feature film versions of The Flintstones (1994) and Scooby-Doo (2002). In a new Tom and Jerry cartoon produced in 2000, The Mansion Cat, Barbera voiced the houseowner. After Hanna's death from throat cancer in March 2001, Hanna-Barbera was absorbed into Warner Bros. Animation, with the unit dedicated to the Cartoon Network original series spun off into Cartoon Network Studios. Barbera remained active as an executive producer for Warner Bros. on direct-to-video cartoon features as well as television series such as What's New, Scooby-Doo? and Tom and Jerry Tales. He also wrote, co-storyboarded, co-directed and co-produced The Karate Guard (2005), the return of Tom and Jerry to the big screen. His final animated project was the direct-to-video feature Tom and Jerry: A Nutcracker Tale (2007). He died from natural causes at age 95 at his home in Studio City, Los Angeles on December 18, 2006 at 11:44 p.m., ending a 70-year career in animation. His wife Sheila was at his side. He was also survived by two grandchildren and five great-grandchildren. He was also survived by three children from his first marriage, Jayne (who worked for Hanna–Barbera), Lynn, and Neal. :105–107 He is buried in a private section of the Great Mausoleum in Glendale's Forest Lawn Memorial Park. Most of the cartoons Barbera and Hanna created revolved around close friendship or partnership; this theme is evident with Fred and Barney, Tom & Jerry, Scooby and Shaggy, The Jetson family and Yogi & Boo-Boo. These may have been a reflection of the close business friendship and partnership that Barbera and Hanna shared for over 60 years. :214 Professionally, they balanced each other's strengths and weaknesses very well, but Barbera and Hanna travelled in completely different social circles. Hanna's circle of personal friends primarily included other animators; Barbera socialized with Hollywood celebrities—Zsa Zsa Gabor was a frequent visitor to his house. :52–53, 137–139, 147, 222–224 Their division of work roles complemented each other but they rarely talked outside of work since Hanna was interested in the outdoors and Barbera liked beaches and good food and drink. :120–121 Nevertheless, in their long partnership, in which they worked with over 2000 animated characters, Barbera and Hanna rarely exchanged a cross word. Barbera said: "We understood each other perfectly, and each of us had deep respect for the other's work." Hanna once said that Barbera could "capture mood and expression in a quick sketch better than anyone I've ever known." Barbera and Hanna were also among the first animators to realize the enormous potential of television. Leonard Maltin says the Hanna–Barbera team "held a record for producing consistently superior cartoons using the same characters year after year—without a break or change in routine their characters are not only animated superstars, but also a very beloved part of American pop culture". They are often considered Walt Disney's only rivals in cartoon animation. In all, the Hanna–Barbera team won seven Academy Awards and eight Emmy Awards,:32 including the 1960 award for The Huckleberry Hound Show, which was the first Emmy awarded to an animated series. They also won these awards: Golden Globe for Television Achievement (1960), Golden IKE Award – Pacific Pioneers in Broadcasting (1983), Pioneer Award – Broadcast Music Incorporated (1987), Iris Award – NATPE Men of the Year (1988), Licensing Industry Merchandisers' Association award for Lifetime Achievement (1988), Governors Award of the Academy of Television Arts and Sciences (1988), Jackie Coogan Award for Outstanding Contribution to Youth through Entertainment Youth in Film (1988), Frederic W. Ziv Award for Outstanding Achievement in Telecommunications – Broadcasting Division College – Conservatory of Music University of Cincinnati (1989), stars on the Hollywood Walk of Fame (1976), several Annie Awards,:170 several environmental awards, and were recipients of numerous other accolades prior to their induction into the Television Hall of Fame in 1994.:171 In March 2005 the Academy of Television Arts & Sciences and Warner Bros. Animation dedicated a wall sculpture at the Television Academy's Hall of Fame Plaza in North Hollywood to Hanna and Barbera. ↑ Gifford, Dennis (2006-12-20). "Joe Barbera". The Guardian. London. Retrieved 2010-08-07. 1 2 3 4 5 6 7 8 9 10 11 12 13 14 15 16 17 18 19 20 21 22 23 24 25 26 27 28 29 30 31 32 Barbera, Joseph (1994). My Life in "Toons": From Flatbush to Bedrock in Under a Century. Atlanta, GA: Turner Publishing. ISBN 1-57036-042-1. ↑ "Biography for Joseph Barbera". Turner Classic Movies. 2009. Retrieved 2009-10-12. ↑ Fiecconi, Federico (December 20, 2006). "Barbera, l'uomo che sfidò Disney" (PDF). Il Giornale (in Italian): 33. Retrieved 2009-10-12. 1 2 Whitworth, Melissa (2006-12-20). "Master cartoonist who created Tom and Jerry draws his last". New York: Telegraph.co.uk. Retrieved 2007-02-18. 1 2 "Joseph Barbera". The Times. London. 2006-12-20. Retrieved 2008-09-20. 1 2 Grant, John (1994). Masters of Animation. New York, NY: Watson-Guptill Publications. ISBN 0-8230-3041-5. 1 2 3 4 Itzkoff, Dave (2006-12-19). "Joseph Barbera, Half of Cartoon Duo, Dies at 95". The New York Times. Retrieved 2008-08-23. ↑ Staff (November 2013). "Animation Art Auction catalog, November 20 & 24, 2013, Beverly Hills". Heritage Auctions. 7086: 145. Retrieved 13 November 2013. ↑ Barbera, Joseph (1994). My life in 'toons : from Flatbush to Bedrock in under a century (1st ed.). Atlanta, GA: Turner Pub. ISBN 978-1-57036-042-8. 1 2 3 4 5 6 7 8 9 10 11 Hanna, William; Tom Ito (2000). A Cast of Friends. Emeryville, California: Da Capo Press. ISBN 0-306-80917-6. Retrieved 2008-08-18. 1 2 3 4 5 Vallance, Tom (2001-03-24). "William Hanna". The Independent. London. Retrieved 2008-08-04. ↑ Adams, T. R. (1991). Tom and Jerry: 50 years of Cat and Mouse. New York, NY: Crescent Books, a Random House Company. ISBN 0-517-05688-7. 1 2 3 "The cartoon dream team". BBC News. 2001-03-21. Retrieved 2008-08-13. ↑ "Legendary cartoonist William Hanna dies". United Press International. 2001-03-23. 1 2 Gifford, Denis (2001-03-24). "William Hanna: Master animator whose cartoon creations included Tom and Jerry and the Flintstones". The Guardian. London. Retrieved 2008-08-21. 1 2 3 4 5 6 7 "William Hanna". The Daily Telegraph. London. 2001-11-22. Retrieved 2008-08-16. ↑ "Hanna Obit". City News Service – Los Angeles. 2001-03-22. ↑ "Tom and Jerry: Episode Guide". Cartoon Network. 2008. Retrieved 2008-09-25. 1 2 Hanna, William; Joseph Barbera; with Ted Sennett (1989). The Art of Hanna-Barbera: Fifty Years of Creativity. New York, NY: Viking Studio Books. ISBN 0-670-82978-1. 1 2 Smoodin, Eric (Spring 1992). "Cartoon and Comic Classicism: High-Art Histories of Lowbrow Culture". American Literary History. Oxford, England: Oxford University Press. 4 (1). ↑ Pearson, Richard (2001-03-25). "William Hanna TV Animator". The Washington Post. p. C04. 1 2 3 4 5 "Animation Legend William Hanna Dead". CBS News. 2001-03-21. Retrieved 2008-08-14. 1 2 3 "William Hanna Dies at 90; Created Cartoon Characters". The New York Times. 2001-03-23. Retrieved 2008-08-06. 1 2 3 4 5 6 7 8 9 10 "Animation legend William Hanna dies at 90". CNN. 2001-03-23. Retrieved 2008-08-06. ↑ Blake, Corey; Shaw!, Scott (2012-11-14). "Thank You, Comic Books!". The Comics Observer. Retrieved 2013-05-12. ↑ "Dearfield Publishing". Grand Comics Database. Retrieved 2013-05-12. ↑ "William Hanna". The Times. 2001-03-24. 1 2 Moore, Ron (2001-03-24). "Toons King Dies; Hanna's Magic Touch Brought Us Fred, Yogi, and Scooby-Doo". Daily Record. 1 2 3 4 5 6 7 Mullen, Megan. "Hanna, William, and Joseph Barbera: U.S. Television Animators". Museum of Broadcast Communications. Retrieved 2008-08-10. 1 2 3 4 5 Savage, Mark (2006-12-19). "Hanna Barbera's golden age of animation". BBC News. Retrieved 2008-08-13. ↑ "Legendary American cartoonist dies". BBC News. 2001-03-21. Retrieved 2008-08-10. 1 2 Kerr, Alison (2001-03-24). "William Hanna; Cartoon scriptwriter with a natural gift for gags and comic timing". The Herald. p. 16. 1 2 3 4 Nash, Eric P. (2001-12-30). "The Times They Lived: William Hanna, B. 1910; Stone-Age Visionary". The New York Times. Retrieved 2008-08-15. 1 2 Wells, Paul (2002). Animation and America. New Brunswick, NJ: Rutgers University Press. ISBN 0-8135-3160-8. Retrieved 2008-08-23. 1 2 Thompson, Kirsten Moana (2004-01-12). "Animation and America by Paul Wells". Film Quarterly. University of California Press. 58 (2). 1 2 Buncombe, Andrew (2001-03-24). "William Hanna, the cartoonist who transformed animation, dies aged 90". The Independent. London. Archived from the original on 3 July 2009. Retrieved 2008-08-17. 1 2 Hogan, Sean (2001-03-23). "William Hanna". The Irish Times. p. 16. Retrieved 2008-08-17. 1 2 Alasdair, Steven (2001-03-28). "William Hanna, animator and cartoon creator". The Scotsman. ↑ International Directory of Company Histories. 23. Farmington Hills, MI: St. James Press. 1998. Retrieved 2008-08-19. ↑ Natale, Richard; Phil Gallo (2001-03-21). "William Hanna". Variety. ↑ Leonard Maltin (1997). Interview with Joseph Barbera (Digital). Archive of American Television. 1 2 Rinker, Harry L. (February 1996). "William Danby Hanna and Joseph Roland Barbera". Antiques & Collecting Magazine. 100 (12): 24. 1 2 "Animation Legend Joseph Barbera Died Today". TimeWarner. 2006-12-18. Retrieved 2008-09-20. 1 2 "Obituary: Joseph Barbera". BBC News. 2006-12-18. Retrieved 2008-09-20. ↑ Vallance, Tom (2006-12-06). "Joseph Barbera". The Independent. London. Retrieved 2008-09-20. ↑ Carlson, Jen (2006-12-19). 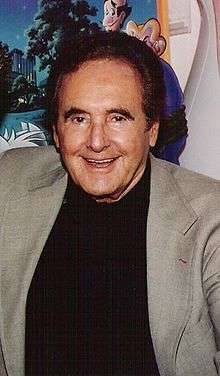 "Joseph Barbera, 1911–2006". Gothamist. Retrieved 2008-09-20. ↑ "Tom and Jerry: A Nutcracker Tale". Imdb. 2007. Retrieved 2008-09-20. ↑ "Cartoon creator Joe Barbera dies". Dallas Morning News / AP. 2006-12-18. Archived from the original on January 4, 2007. Retrieved 2006-12-18. ↑ Bahn, Paul G. (April 14, 2014). The Archaeology of Hollywood: Traces of the Golden Age. v. ISBN 978-0-7591-2378-6. ↑ "Cartoon pioneer William Hanna dead at 90". USA Today. 2001-03-23. Retrieved 2008-08-19. ↑ Glendinning, Lee (2006-12-19). "Joe Barbera, creator of cartoon classics, dies at 95". The Guardian. London. Retrieved 2008-08-04. ↑ Juddery, Mark (2001-03-29). "Cat and mouse game fathered TV cartoon empire". The Australian. News Limited. p. 12. ↑ "Bugs Bunny tops greatest cartoon characters list". CNN. 2002-07-30. Retrieved 2008-08-14. 1 2 "William Hanna – Awards". allmovie. Retrieved 2008-08-12. ↑ Vallance, Tom (2006-12-20). "Joseph Barbera: Animation pioneer whose creations with William Hanna included the Flintstones and Tom and Jerry". The Independent. ↑ "The Academy of Television Arts & Sciences on Wednesday unveiled a 1,200-pound bronze wall sculpture, dedicated to animators and show creators Joseph Barbera and the late William Hanna, at its Hall of Fame Plaza in North Hollywood.". Daily Variety. 2005-03-17. Cawley, John; Jim Korkis (1990). The Encyclopedia of Cartoon Superstars: From a to (Almost Z). Las Vegas, NV: Pioneer. ISBN 1-55698-269-0. Erickson, Hal (1987). Television Cartoon Shows: An Illustrated Encyclopedia, 1949–1993. Jefferson City, NC: McFarland & Company. ISBN 0-7864-0029-3. Horn, Maurice (1980). The World Encyclopedia of Cartoons. New York, NY: Chelsea House Publishing. ISBN 0-87754-088-8. Lenburg, Jeff (2011). William Hanna and Joseph Barbera: The Sultans of Saturday Morning. New York, NY: Chelsea House. ISBN 1-60413-837-8. Mallory, Michael (1987). Hanna Barbera Cartoons. Englewood, NJ: Universe. ISBN 0-88363-108-3. Maltin, Leonard (1987). Of Mice and Magic: A History of American Animated Cartoons. New York, NY: New American Library. ISBN 0-452-25993-2.